Crowdfunding is a way to gather funds from individuals, mainly through the Internet, to help people realize their ideas for new products, activities and other projects. Though COUNTDOWN is one of a number of Crowdfunding Platforms in Japan, its activities are not limited to the domestic market. 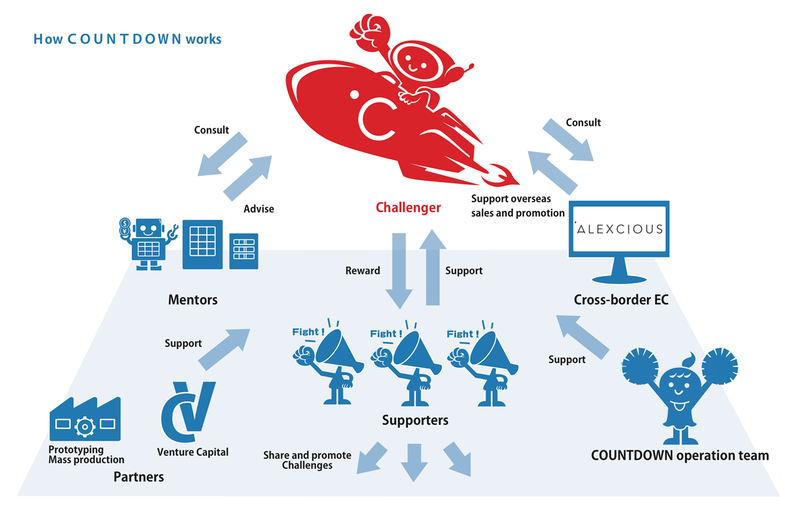 In the world of COUNTDOWN, people who wish to have their projects reach fruition are known as "challengers", and those willing to support such challengers with funds are "supporters". Talented people with too much genius to fit in at existing companies, inventors persistent in their passions, dreamers who believe in their ability to develop their visions of the future, all such challengers are welcome! Supporters are out there who are willing to cheer your challenge along. Such people appreciate vision, imagination and technology. Many people around the world believe in Japan's potential and are eagerly awaiting more excitement from the country's massive talent pool. Unleash your ability and change the world! Anyone who has such passion is welcome to join the COUNTDOWN world! Funds collected from supporters are transferred to a challenger's account only when their challenge is successfully completed. Each challenge is qualified as a "Success" when the funds hit the target amount by the end-date initially set. The challenger receives the funds when the challenge is successfully completed (less 20% for handling fees and transactional charges). If the challenge fails, the funds are canceled and no credit card or PayPal transactions are carried out. Any funds paid through bank accounts are returned to supporters with the bank transfer deducted. This funding model of Crowdfunding is called All or Nothing (AoN). COUNTDOWN also supports another funding model called All-In or Keep it All (KiA). This model only applies to qualified projects called "Collaboration Challenges." COUNTDOWN applies Purchase-Type Crowdfunding. When the challenge is successfully completed, each supporter receives a COUNTDOWN Reward from the challenger. Supporters set their return and funding amounts in advance.